The dim-lit pool inside the Mandarin Oriental spa, Barcelona. 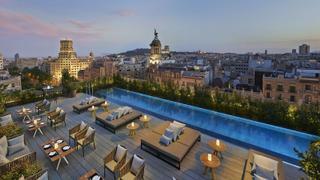 Smack bam in the centre of the city, the spa at Barcelona’s Mandarin Oriental hotel provides an underground sanctuary from the clutter of tapas bars, galleries and boutique shops that surround it. Above ground, the hotel is in easy reach (a 20-minute drive) from the city’s shores and Barcelona’s cultural attractions such as the Gothic Quarter or the distinctive basilica. After days gorging on gambas al ajillo, croquetas and artisanal cocktails (no, those pieces of orange floating in your vermouth do not count as one of your five a day), the Mandarin Oriental Barcelona is a haven for the party-pooped. Behind a grand façade on Passeig de Gràcia, its underground spa is the architectural equivalent of a smoothie and a pair of shades: ultra-low lighting, silky carpets, loungers shielded by curtains of fine black chain and an emerald green pool to dive into. International anti-ageing supremo (and Barcelona local) Miriam Quevedo has developed the new Mediterranean Breeze treatment exclusively for the spa. With the aim of draining toxins, kick-starting the metabolism and stimulating the production of collagen and elastin, it is perfect for indulgence-related complaints. It starts with foot and cranial massages, then moves over the body and ends with a Rejuvenating Ritual Facial that oxygenates and repairs using products from Quevedo’s Glacial White Caviar skincare range – which include ingredients such as white caviar oil, organic edelweiss and cotton flower, and organic baobab oil. It will leave you refreshed, glowing and ready to socialise again. Port Forum, at the end of the famous Diagonal Avenue, takes yachts of up to 80m and is the perfect starting point from which to explore the alleys of bars and restaurants.